For those seeking an answer to the FAQ, “What was it like in the Scottish Iron Age?”, the bad news is that the most definitive “I was there” written account is forever lost, probably around two thousand years ago. On The Ocean – a record of a remarkable journey undertaken by the Greek navigator, geographer and merchant Pytheas from what is now Marseilles – told the tale of a journey from Gaul far into the North Sea and to Britain, including perhaps North West Sutherland and beyond. Pytheas may even have travelled to Iceland and as far as the Arctic Circle but this cannot be verified. Although the work itself did not survive, details and fragments were kept alive through vigorous debate (not least about the veracity of his claims) by his contemporaries. Many called him a fantasist, but the head librarian at Alexandria championed his work. A keen sailor herself, Haggith has taken, for the first novel in her trilogy, the essence of the Pytheas story to weave her own saga of Iron Age life, travels and travails, beginning in a broch near Clachtoll in Assynt. This broch and its site are factually accurate and are currently being excavated. For those who know the site and the area, it is fascinating to be transported beyond its pile of stones and into a dark interior of smoke and smells. It is into the bay at Clachtoll that a sailboat suddenly arrives bearing traders and craftsmen, as well as Pytheas and the malevolent and charismatic Ussa. And when, after much feasting and drinking and bartering of goods, the boat sets sail, it has an extra pair of hands aboard. This is fifteen-year-old Rian, foster child of the broch’s family, and now the slave of Ussa who has ‘won’ her in a game of chance. In a shocking and beautifully written passage, the account of this casual transformation from free child to owned and branded slave describes the out-of-body horror, disbelief, betrayal and pain that has been the slave’s experience since the beginning of time. This is a very fine travelogue, and at times almost does not require the storyline, such is the intensity of the relentless sea, the barrenness of the landfalls, and the bounty of medicinal herbs and plants that abound around the desolate brochs. From Thule the voyagers reach Shetland where the brochs at Clickimin and Mousa form the backdrop for more sorrows for Rian before a further adventure via Fair Isle and a final drama, where the apparent fragility of Manigan’s boat being pursued by Ussa in a far larger craft is likened to ‘A little puffin of a thing, pursued by a skua’. A vibrant and delicate image. The eponymous Walrus Mutterer, Manigan, is the romantic lead and it seems odd that the male love interest is given top billing in a work that is primarily about the desperate trials and shocking tribulations of a young enslaved woman. It is also unfortunate that such a well-travelled and worldly man, who communicates non-verbally with large mammals to the point of placing them in a trance, and participates in women-centred rituals, seems incapable of grasping that a young woman in slavery might be subject to a range of verbal, physical and sexual assaults on a regular basis. And while a female point of view is very welcome, there are times when Rian comes across as more Chihiro in the animation Spirited Away than, for example, Ayla in Jean M. Auel’s Clan of the Cave Bear. But there is much to love in this novel. Meticulous research has been sprinkled lightly across the pages and we learn almost accidentally of medicinal herbal remedies for conditions ranging from blisters caused by relentless rowing to DIY abortions, about the crops that grew, the meals that were eaten on both a daily basis and on feast days, the clothes and the customs, the wisdom and the storytelling, and of course the drudgery of the quotidian tasks of life in a broch. We learn of customs and matriarchal modes of worship and the centrality of myths and superstition. And yet I could not rid myself of an unease. If this were set in a Dundee housing estate where perhaps a young Philippine woman has been trafficked to work in a nail bar behind the bus depot, being passed from owner to owner in exchange for sexual favours rather than precious jewels, and who managed to escape and then fell in love with a tall handsome stranger within weeks of being raped and while carrying a child, it would not ring entirely true. My concern is that a less-than-convincing narrative has been grafted onto, and is being swept along by, a harsh but beautifully rendered two-thousand-year-old lifestyle and a near-poetic account of the natural world. I have long felt that the best history and most factual learning can be learnt from quality fiction. There may never have been a walrus mutterer but this barely matters. The journeys and the ordeals, the tradings and the warrings, the myths and the methods and the madness, all of this creates a tapestry infinitely more vivid and engaging than mere historical analysis. There is a moving symmetry in placing the Assynt broch at the centre of this story. That there was a community in Clachtoll in the Iron Ages, demonstrating a continuity of habitation through to the present day, is particularly poignant in this the twenty-fifth anniversary year of the Assynt Crofters buyout of the Assynt Estate (which includes Clachtoll) that has suffered so much from multiple ownership, enforced emigration and the deliberate destruction of the social fabric and the land itself. Tumble-down brochs rub shoulders with abandoned croft houses. The Walrus Mutterer is a thread from the past to the present and deserves a place in the history – and fiction – of this beautiful corner of Scotland. 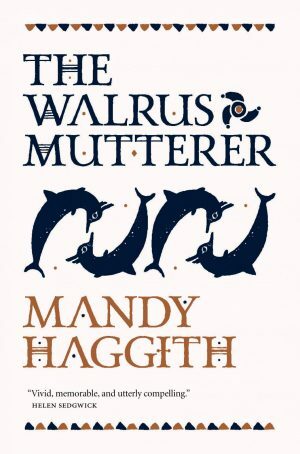 The Walrus Mutterer by Mandy Haggith is published by Saraband, 2018. Alison Napier lives in Perthshire. Her fiction and non-fiction has appeared in various anthologies, journals and national newspapers. Her first novel, Take-Away People, was shortlisted for the 2015 Dundee International Book Prize and she can be contacted via www.alisonnapier.com.